Dealing with criminal charges in Brampton can prove to be a daunting and often stressful ordeal. For this reason, it is absolutely imperative that you have the right Brampton criminal lawyer by your side. The right Brampton criminal lawyer will not only work hard for you but will ensure your rights are protected within the justice system. This combination will guarantee that the most successful results are achieved. The criminal law attorney focuses its work on the “front end” of the criminal justice system—from policing to sentencing seeking to end excessively harsh criminal justice policies that result in mass incarceration, over-criminalization, and racial injustice, and stand in the way of a fair and equal society. A crime is any act or omission of an act in violation of a public law forbidding or commanding it. 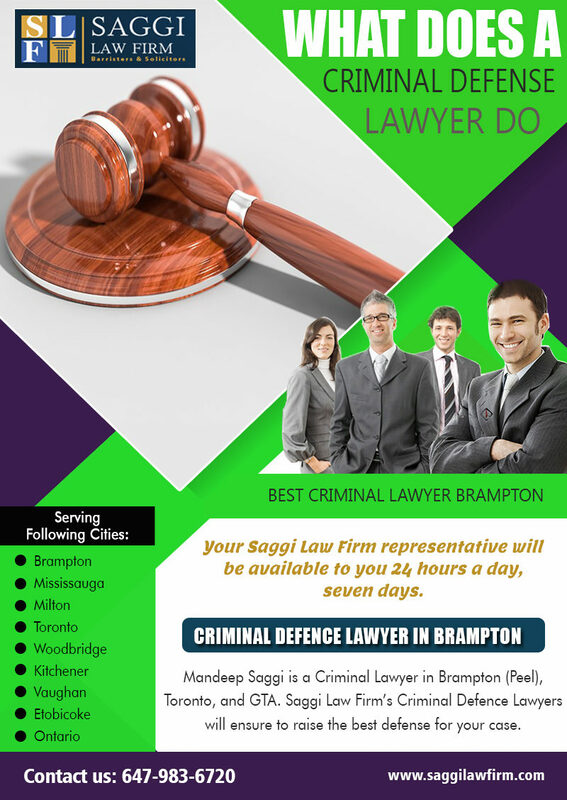 Criminal law regulates the social conduct and behavior of persons and prescribes whatever is threatening, harmful, or otherwise endangering to the health, safety, moral welfare of people and the property.Mandeep saggi lawyer represents their clients with a high magnitude of interest and preparation. The first thing they can do for you then is to help you to know what to expect and to prepare accordingly. They can help you to know what you need to take for the occasion, they can help you to know how likely you are to your case and they can reassure you at every step of the way. During the initial investigation, the lawyer works with the police to examine evidence found at the crime scene and collaborate witnesses testimonies of what they saw happen. He’ll also investigate the motives behind both the accused and the accuser’s actions. Keep in mind the Criminal Defense Attorney Fees In Brampton before finalizing one. Based on the collection of evidence the lawyer determines whether to pursue a criminal case. If more evidence is needed, the investigation will continue. But if sufficient evidence is available, a court date will be set. Criminal law involves prosecution by the government of a person for an act that has been classified as a crime. During the trial, the criminal lawyer will strive to prove the defendant guilty or innocence through presenting the evidence found at the crime scene and by questioning individuals who were witnesses of the crime. He should try and obtain the most beneficial punishment for the accused. Even if the evidence unequivocally points toward a guilty verdict, a sentence in prison may not be the best option. Depending on the crime, there are many rehabilitation options that ought to be considered if the accused will not be a danger to society.Brampton Criminal law includes the punishment of people who violate the laws by imprisonment, fine, forfeiture of property, etc. A criminal lawyer is someone for whom court cases are a common affair. They are completely used to the concept of going to court and handling big cases and thus they are very familiar with the proceedings, what to expect and what will happen. Saggi law firm lawyers do take precautionary steps to ensure and guarantee the maximization of client’s best interests. Criminal lawyers are of course one of the most momentous and salient people in the legal arena. In fact, they come up with some of the best known legal arguments for an appropriate defense and ensure high compliance. Barristers often act as criminal lawyers for first-class advocacy! Most of them charge viably and are always open to aid with the best legal suggestions. They can act swiftly in criminal cases that involve kidnapping, robbery, people trafficking, money laundering, serious fraud and assaults, murder (manslaughter), organized crime, corruption, blackmail, and even bribery. Ensure that you feel comfortable discussing your problems with the lawyer In Canada. You also need to make sure that he/she is not overburdened when attending to your case. The lawyer must have the required time to pay attention to you and the case. While you are talking with the attorney, gauge how well he or she explains things so that you can understand them. Pay attention to how much the attorney listens to you and addresses your specific needs. Try to determine whether he or she is attentive your particular case, or if it sounds like he or she is merely reciting a speech. If the attorney seems to get interrupted for other matters while meeting with you, this could be a sign that your case is not going to get the attention it deserves. It is always good to seek and avail the services of criminal lawyers with an impressive breadth of practical knowledge and exceptional expertise. If the criminal case is too serious, then procuring the legal support of barristers who have earlier worked on high profile cases. This way, the clients have a better chance to walk out of the troublesome road. Saggi law firm Criminal lawyers come to the rescue of individuals who are faced with criminal charges. Hiring a criminal lawyer makes the proceedings smooth and easier. He will offer assistance and guidance relating to legal matters. An individual charged with criminal activities needs a professional with legal knowledge who can defend him. A court does not pass any judgment without hearing both the parties involved in the case, these lawyers are given to the criminals by the court itself. The lawyer then studies the case thoroughly and represents the defendant accordingly. 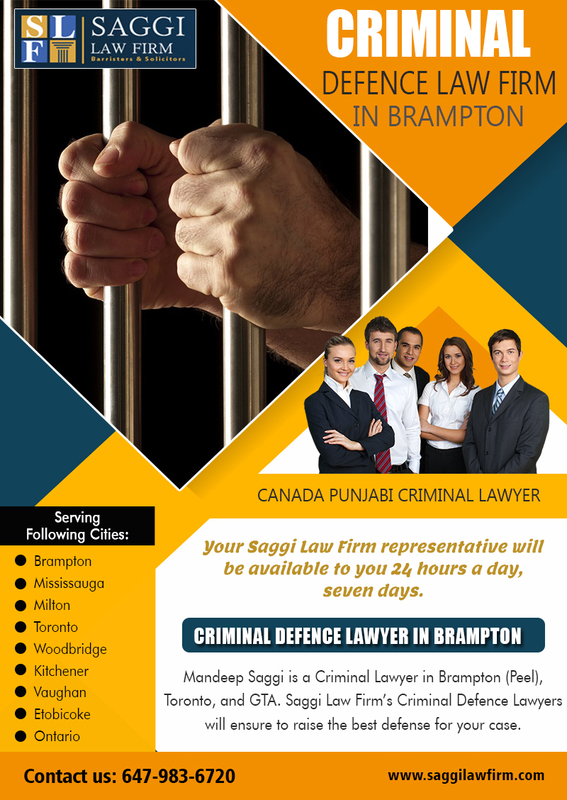 You need representation by an extremely skilled Punjabi Criminal Lawyer in Brampton, one that has an extensive background in cases just like yours. The trial experience of the lawyers, along with a personal commitment to clients, combine to offer the prospective client competent representation in a supportive, hands-on environment. He will not be timid and will fight aggressively, closely examining every shred of evidence related to your case.A well qualified Canada Punjabi Criminal Lawyer will make sure that your case is properly studied, all the strategies decently planned, all the evidence intensively analyzed, justice is served, and that you are treated fairly. His philosophy is grounded in the strong belief that his clients should be fully informed about every aspect and every step of their case as it progresses. Each case is given the individual attention that is needed to bring it to a successful conclusion. The first thing your Criminal Defence Lawyer Canada will do when they take on your case is to evaluate it. This will consist of thorough reading and assessment of the charges that have been filed against you in addition to your lawyer investigating the evidence that the prosecutor plans to use during your trial. Your attorney will also interview you and various witnesses on your behalf, in order to get a thorough assessment of your side of the case.